*Note: when developing for iOS with Visual Studio for Windows, you will need to have access to a Mac on your network that has XCode installed. Debugging and execution on the iOS Simulator actually runs on the connected Mac and not on the PC hosting Visual Studio. 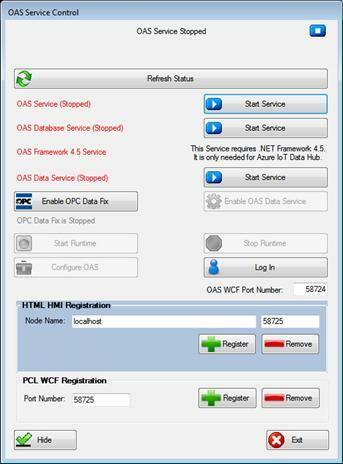 To use the OAS PCL components you must first register the PCL WCF Server. This is done with the OAS Service Control Manager with the PCL WCF Registration. Define the Port Number that is to be supported, and click Register. This will configure a WCF listener that will accept communications from applications using the Portable Class Library. This port number defaults to 58725, which is the same as the HTML HMI registration, but they do not conflict with each other and can exist on the same port. Be sure to stop all services before registering, and make sure all services are started back up afterward. The instructions below are for Visual Studio 2015. 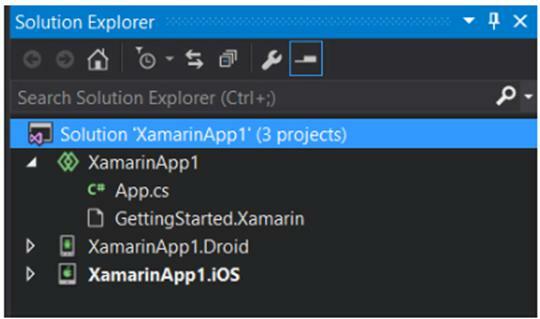 Read more on Installation of Xamarin Forms for all versions of Visual Studio including VS 2017 for Windows. See the following for Installation of Visual Studio for Mac. Templates > Visual C# > Cross-Platform. 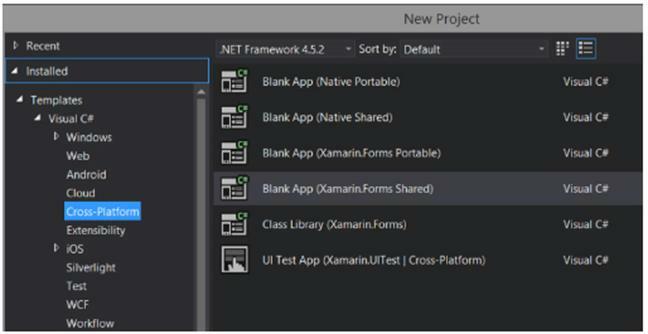 Select the project type of Blank App (Xamarin.Forms Shared). This will create a single shared application code base, and individual projects for each deployment target, including Android, iOS, Windows Universal Platform, Windows Phone and Windows. For this project we’ll only be using the Android and iOS projects, so once the solution is created, remove all other project targets so you’re left with just the shared app code and the projects for the the desired targets. 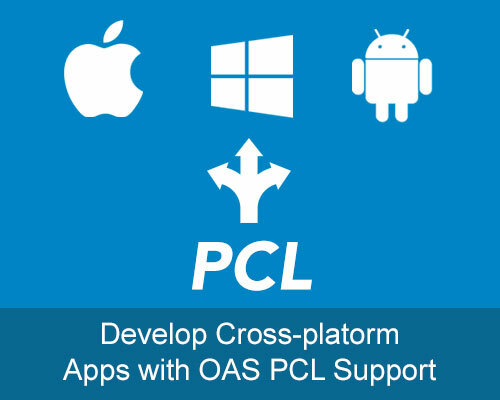 Add references to the PCL assemblies. These are located in your Open Automation Software installation directory (typically C:\Program Files (x86)\Open Automation Software\OPC Systems.NET). You need to add references to the following files in every individual deployment target project. So in this case, you need to add these references to both the iOS and Android projects. These assemblies are the Open Automation Software Portable Class Library (OASPCL.dll), and 3 open source PCLs that assist with serialization and encryption. Update shared source code in the App.cs file. This will house all of the application code and will be shared by both iOS and Android projects to make it easier to maintain code for multiple devices. 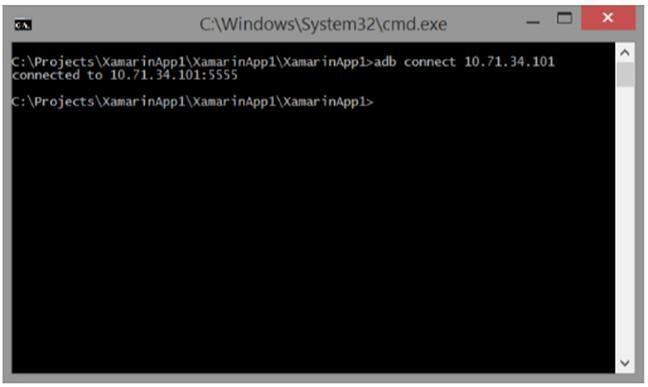 First, add in a reference to the OASPCL namespace, along with application-level variables. The OPCSystemsComponent is used to configure OAS Server and tag settings, and is not used in this example, but the OPCSystemsData component is. Server – A string that holds a reference to the IP address of your OAS server where we will be reading and writing data. This may be the localhost of the machine with Visual Studio, but the compiled mobile apps may not be running locally, so localhost or 127.0.0.1 may not work. This needs to be the IP address on the network for your OAS server. bPumpSet – A boolean flag that determines if we have gotten values from the server for the Pump.Value tag so we know when it’s safe to allow updates. 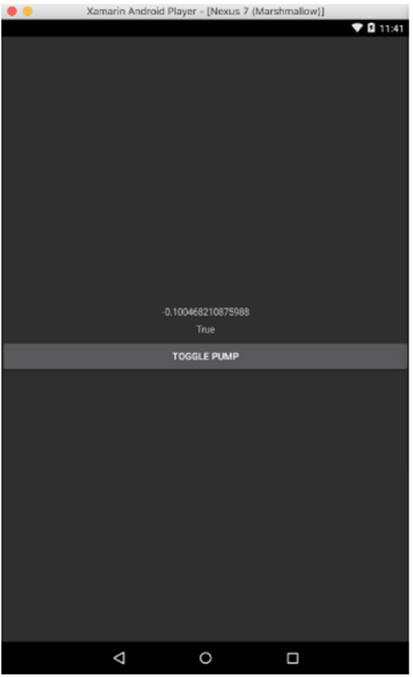 PumpVal – A boolean to hold the current value for the Pump.Value tag. Now we’ll add some code to monitor server tags and handle updates when values change. The AddTag method adds a tag to the list of tags to monitor. You can also use the AddTags method to add more than one at a time. The ValuesChangedAll event is fired every time the server values have changed for any tag being monitored. This event will be passed a list of tags, values, data qualities, and timestamps for each update. If values have not changed for some tags, they will not be included in the arrays passed to the event. In the event handler, we will iterate through the list of tags and update labels when their respective values have changed. Note: We must execute UI updates within a Lambda (a C# anonymous function) tied to the Device.BeginInvokeOnMainThread. This hands over the execution to the main UI thread. If this is not done, crashes or unexpected results could occur. The last bit of code will be to handle the clicking of a button and triggering an update on the server when that happens. First we’ll update the App constructor to include the new labels and button in the layout. Then we add a Clicked handler to the button. We use the SyncWriteTags method to send up a list of tag/value pairs. 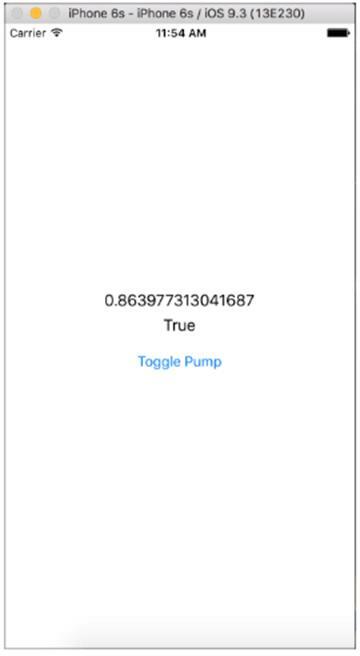 In this case we’re just sending up the Pump.Value tag and the inverse of the current value to effectively toggle it. 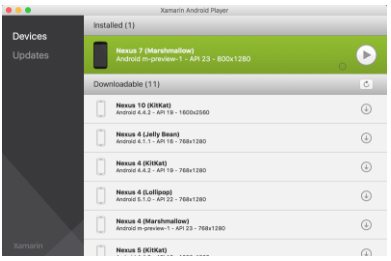 Start by running the Xamarin Android Player. If you do not have this installed, you can download it here. You’ll then need to download and install device images that the Player will use. 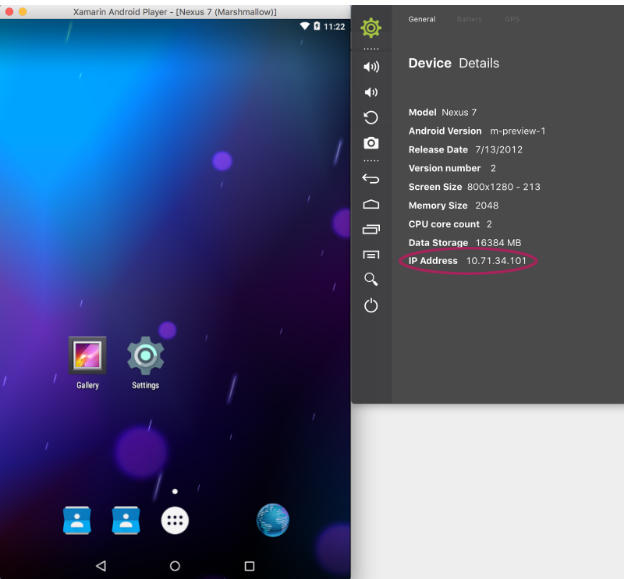 For this example, we chose the Nexus 7 with Marshmallow build of the Android OS. Once you’ve downloaded the device image you can start it up by hitting the Play button. This will run the device emulator. After the device has started, you can then click on the gear icon to get details. The important field is the IP address. We’ll use this to connect Visual Studio for debugging. Replace the IP above with the IP of your Android device. You should see a successful connection. You’re now ready to debug the project. In the Visual Studio toolbar, make sure your Android Device is selected as the target and then select Start Debugging. The project will build and then be deployed to the device. Note: If you get an error related to missing “provisioning profiles”, this is common. To fix it, select the iOS project, then be sure to select the iPhoneSimulator as the target. Then return to the Android project and try again. Even though we were debugging the Android project, the iOS project will compile and throw errors. As stated earlier, to build and test an iOS app, you must be connected to a Mac on your network. This Mac must have XCode installed along with the Xamarin Mac Agent. This allows Visual Studio to connect to the Mac and use its Simulator for debugging. 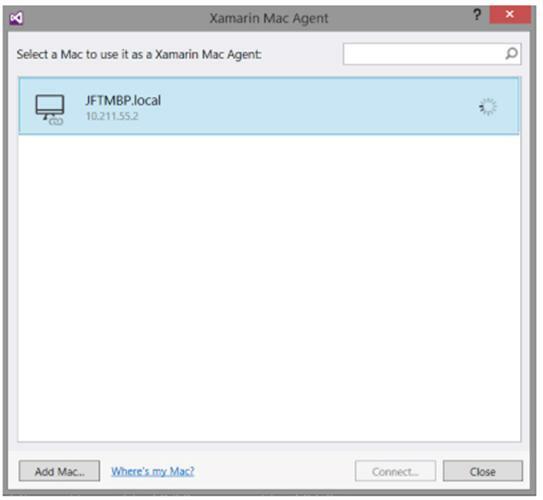 The simplest way to get the Xamarin Mac Agent on your test machine is to install Xamarin Studio for the Mac found at http://www.xamarin.com/download. Locate your Mac in the list and click Connect. If it is not on the list, click Add Mac… to enter connection details manually. You can now select the iOS project and target the iPhoneSimulator, choosing the model you want to test. In this case we’ve chosen the iPhone 6s. 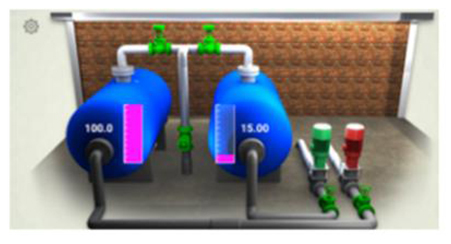 The models and iOS versions available to you will depend on the version of XCode and Simulator installed on your Mac. Now select Start Debugging and the app will compile, deploy to the simulator and start. Switch over to your Mac and you should see it running. As you can see, the labels and button are similar to those on the Android version, but particular to the iOS app. This allows you to develop an app that is familiar to each target platform user while remaining on a single code base. For more details on how to use the OPCSystemsComponent or the OPCSystemsData components, you can refer to the Programmatic Interface section of our online help. The PCL versions of these components have the same interface as the standard .NET components, so all code examples will function in the same way.